Cupra has been announced as a new standalone brand, no longer just a performance trim level on Seat models. The Cupra Ateca is its first model, and it’s here to establish the brand as a company in its own right. 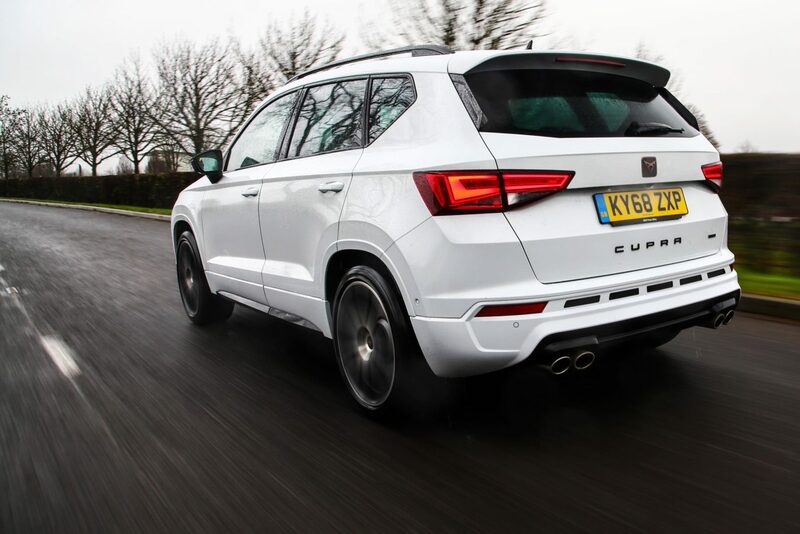 Though it does use the same platform as Seat’s popular Ateca SUV, the Cupra version has been given a range of performance modifications to make it a far more capable machine on the road. Like we mentioned, the Cupra Ateca shares its platform with the regular Seat Ateca. Don’t let that fool you into thinking this is just a warmed-up SUV with some jazzy badges, though – some serious mechanical upgrades have been applied here. There are also a range of exterior and interior upgrades to be found, helping to differentiate it against some of its more mundane relations. 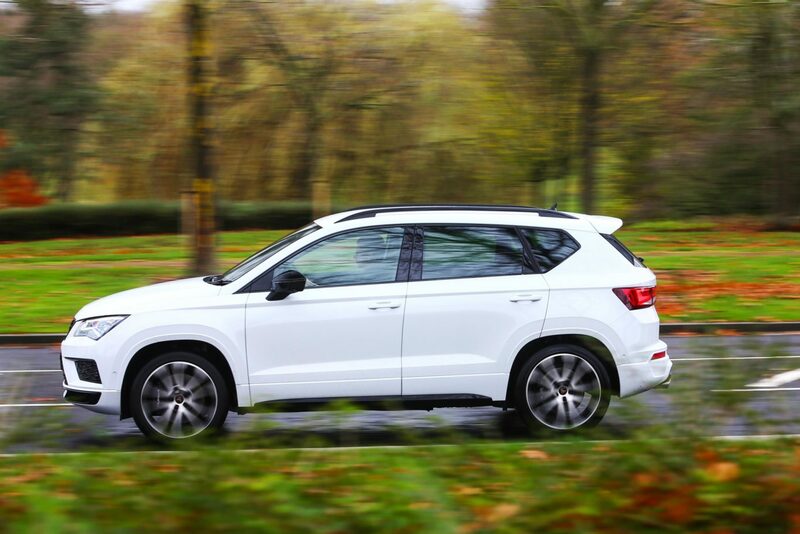 There’s just the one engine option available, and save for a few exterior colours and a handful of equipment packs, there’s not a huge amount of customisation available on the Cupra Ateca. Residing underneath the Cupra Ateca’s bonnet is a 2.0-litre turbocharged petrol engine with 296bhp and a considerable 400Nm of torque. It’s essentially the same engine as the one you’ll find in Volkswagen’s potent Golf R.
Power is sent to all four wheels via a seven-speed DSG gearbox. 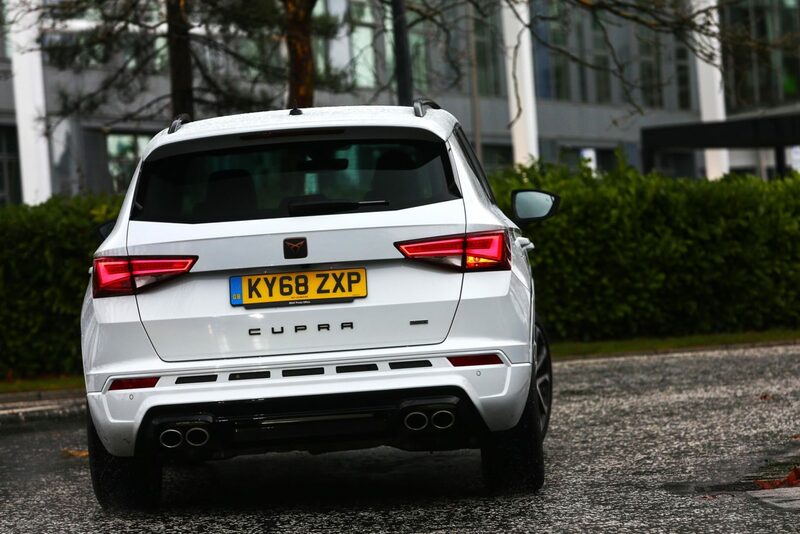 This means the Cupra Ateca is graced with impressive performance figures and 0-60mph takes just five seconds, while flat-out it’ll crack 153mph. Despite this, it’s not bad economy-wise, with Cupra claiming 38.2mpg combined, and emissions of 168g/km CO2. It means that though it can out-perform a lot of hot hatches, you won’t be spending all of your time at the petrol station topping it up. The initial impression that you get when behind the wheel of the Cupra Ateca is simply how normal it feels. When you’re ambling around town it feels as if you’re driving a regular Ateca – albeit one with a slightly firmer ride. Then, you get the opportunity to open the car up a bit, and the difference is quite clear – it’s ferociously fast in a straight line. The gearshifts are brisk enough (it can be slow to kick down at times), and that forward progress is matched with a purposeful – if not particularly tuneful – growl from the exhaust. The steering is relatively light, but it’s not a hard car to place. One of the stand-out features were the brakes; the upgraded Brembo units provide excellent stopping performance, allowing you to brake harder and later than you would with conventional units. Save for a smattering of Cupra-specific badges and four hard-to-miss exhaust pipes at the back, the Ateca looks relatively unchanged from the regular version. In truth, the car’s appearance could be played down even further as in our eyes an understated yet hugely powerful SUV is a very cool thing indeed. The badges themselves are likely to divide opinion, particularly given how little is known about the brand at the moment, but the overall impression is a good one. The large alloy wheels look the part with their intricate design, and the bronze elements dotted across the car’s exterior help to make it stand out a little further. It’s not a bold design, but it’s one which works in the metal. It’s a similar story when it comes to the cabin. There’s some contrast stitching used throughout the interior and some carbon-fibre effect trim, but for the most part it feels standard Seat fare. The front seats are sports versions and are hugely supportive, but save for those it feels much like a normal Ateca. Again, that’s no bad thing; it means there’s plenty of space for those sat in the back, and the general fit-and-finish is top-notch. The car’s four-wheel-drive system brings down the car’s boot capacity, but it’s still large enough for several weekend bags or a lot of shopping. And, of course, you can extend it by folding the rear seats flat, too. You’re not going to be left wanting for equipment in the Cupra Ateca, that’s for sure. 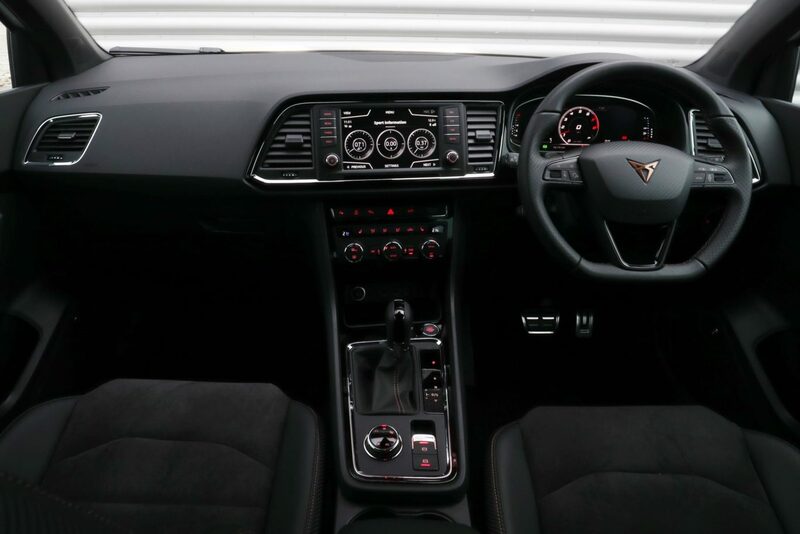 It benefits from the brand’s latest infotainment system, which houses satellite navigation and media functions. It’s easy to navigate too, with clear, logically laid-out displays and a responsive touchscreen. It also incorporates Apple CarPlay and Android Auto, both of which integrate exceptionally well into the car’s system. 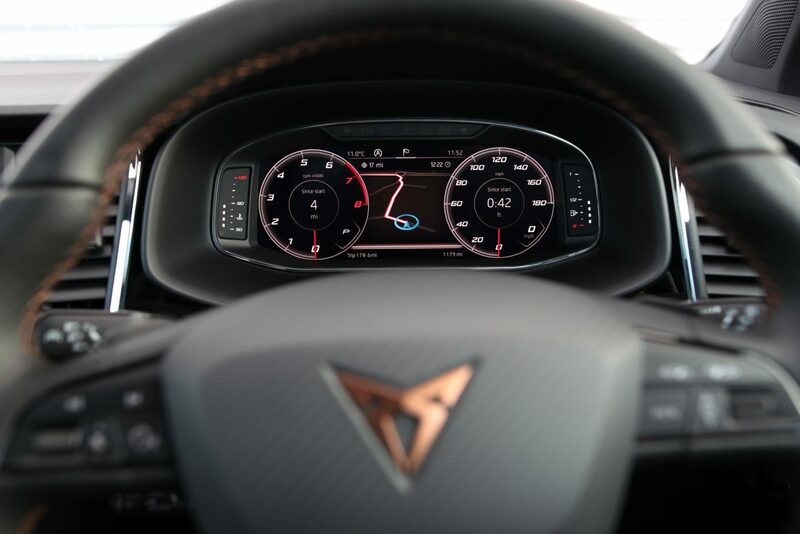 The Cupra Ateca also gets a virtual cockpit-style central display set-up, relaying key information such as navigation instructions back to the driver in the space where the traditional dials usually sit. You get key speed readouts too, of course, but it means it’s easier to see useful displays without having a look away from the road for too long. The Cupra Ateca may be expensive at close to £40,000, but it’s an attractive proposition. It’s practical, well-made and it goes like the clappers too. For those who want a performance SUV to be seen in, it may not make so much sense. But for those who find going quickly under-the-radar appealing, then the Cupra Ateca could be the car for you.